Live orchestral accompaniment makes such a difference when it comes to dance performance! The last time I was at the Paramount Theatre for an Oakland Ballet Company program, I commented that at times, the recorded mix was so clippy and loud that it distracted from what was happening on stage. Not so yesterday for the opening of Graham Lustig’s The Nutcracker. 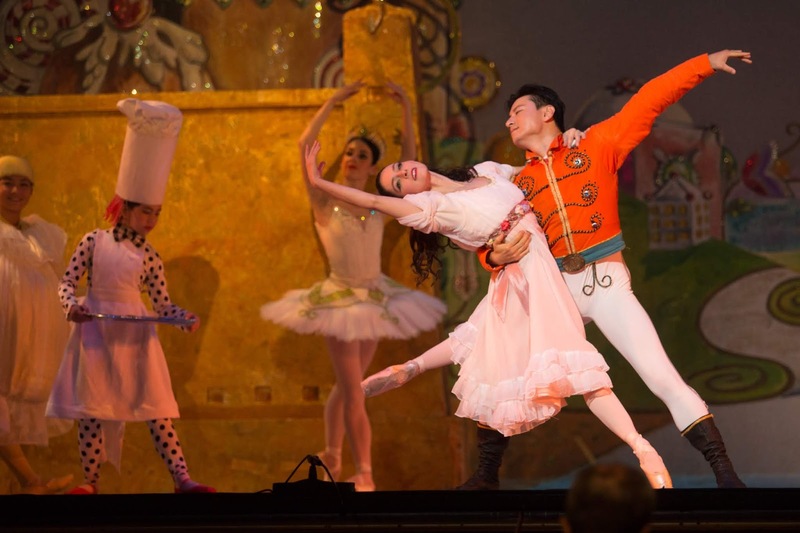 As has been the tradition in past years, the Oakland Symphony, under the direction of Michael Morgan, and the Piedmont East Bay Children’s Choir joined the troupe for their annual pre-Christmas run of the story ballet. 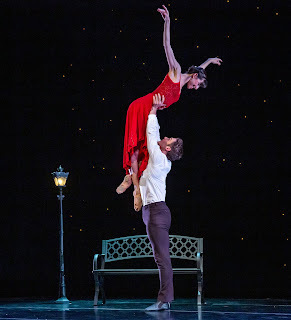 Live music combined with a festive narrative and splendid dancing made for a simply magical afternoon at the theater. Artistic Director Lustig’s version of The Nutcracker is a classic one, told through the eyes of Marie, the ever-riveting Ramona Kelley, and her Nutcracker Prince, the confident, poised Seyong Kim. But classic should not be confused with standard or stale. To the contrary, this Nutcracker has innovation and creativity to spare. This Christmas Eve party is filled to the brim with energy. Many different characters arrive to celebrate the season, including Marie’s Cousin Vera (Jackie McConnell) and her suitor (Thom Panto). Marie seems completely taken with them both, so what a perfect plotpoint that is they who later transform into the Sugar Plum Fairy and the Cavalier. In this adaptation, Uncle Drosselmeyer is a much dancier role, handily portrayed by Vincent Chavez. He is wonderful addition to the fête, which is awash with intricate and interesting choreographic episodes. And with dancers! So, so many dancers! The cast’s spatial awareness was absolutely second to none – I didn’t notice a single collision during the party’s many dances. It’s only too bad that a lot of the choreography was hidden. With the presents arranged in a large pile, front and center, much of the footwork and pointe phrases were obscured from view. Lustig keeps the battle scene moving along (which suits this viewer just fine), with winning choreography for the Nutcracker. Until he removes his mask, the steps are appropriately stiff and mechanical, framed by flexed feet and angular arms. Then he transforms into a real being and the choreography similarly shifts. Gone are the mechanized steps, having been replaced by swirling lifts, dipping turns and jeté entrelaces. The Nutcracker’s first pas de deux with Marie had such joy and levity, flowing effortlessly into the wintry snow scene swirling with snowmaidens and snowballs. The charm continued as Act II’s divertissements took over the stage – Spanish, Arabian, Chinese Nightingale, Russian and German (often French in other renditions). With its changements en pointe and Russian pas de chats, Nina Pearlman’s nightingale variation was a stand out amongst the group. And though it might have been a little finicky from time to time, I also quite enjoyed the choreography for the German pas de quartre. But the internal bows from all these soloists and small groups - to the audience and then to Marie and the Prince – definitely needed to be sped up. The breaks created a rather halted stop and start feel. That is until the waltz of the flowers got underway and the action picked up again with pulsing, billowy choreography lead by Marie and the Prince. And McConnell and Panto were probably the best Sugar Plum Fairy/Cavalier duo that I’ve ever seen at the Oakland Ballet. He with sky-high extensions and impressive fouettés; she with enviable pointework, serpentine rond versés and impenetrable balances. They were truly a regal pair, ideal monarchs to reign over the land of the sweets. Celebrating the past and looking towards the future has been a theme at Smuin this year, with the contemporary ballet company marking its twenty-fifth anniversary season. 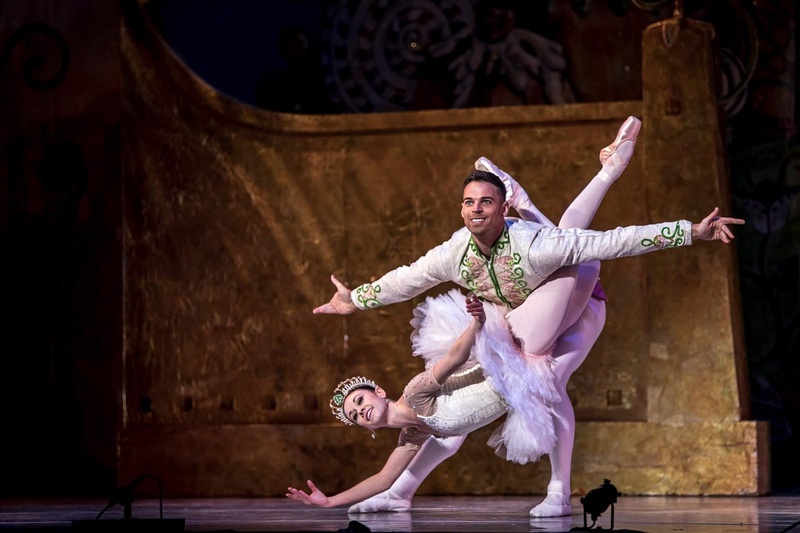 That sentiment certainly rang true in 2018’s edition of The Christmas Ballet, which is just about to finish its annual San Francisco run at Yerba Buena Center for the Arts. Featuring thirty distinct, festive dance vignettes, the two-part wintry revue paired choreographic favorites from years past with more recent additions as well as two world premieres. As always, the performance moved along at a brisk pace - if a particular dance or piece of music wasn’t your speed, something new would be along in short order. If you’re a fan of traditional ballet vocabulary and sweeping scores, Act I’s ‘Classical Christmas’ is a great fit. The cast is costumed in sparkling, bright white; the staged is adorned with large billowy fabric swaths; and the subtle lighting sets a demure mood. Several works stood out amongst this first group of fifteen. Terez Dean Orr and Robert Kretz in company founder Michael Smuin’s Hodie Christus Natus Est were the epitome of elegance and grandeur. One cannot ignore the abundance of lovely lines and steps, but what sets this pas de deux apart are its unexpected moments. 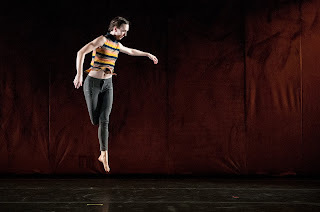 Supported jumps had surprising landings, finishing en pointe but with the leg in plié; lifts would spin backwards with the shoulders being the only point of connection between the two. Longtime Smuin Choreographer-in-Residence and now the Artistic Director of Sacramento Ballet, Amy Seiwert’s Caroling, Caroling, Bright, Bright tackled the complex pas de cinq configuration, and in doing so, revealed its compositional potential and promise. 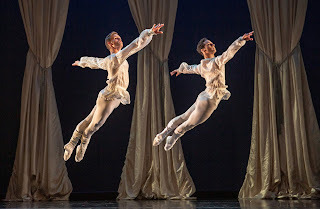 Premiering this year was former company artist Rex Wheeler’s God Rest Ye Merry Gentlemen, a duet danced by Mengjun Chen and Ben Needham-Wood at this matinee. While the choreography itself was a bit busy for my taste, the pairing of Chen and Needham-Wood must be acknowledged. They can do it all – turns, jumps, batterie, balances – and in such precise unison. Delightful Celtic influences also found their way into The Christmas Ballet’s classical offerings. An ensemble dance choreographed by current company dancer Nicole Haskins, Fantasia included a hearty dose of delicate petit allegro – cabrioles abounded as did Italian changements. Fueled by a waltz clog rhythmic base, Smuin’s The Gloucestershire Wassail contributed its own Celtic flair, coupling fast footwork with a quiet upper body. I loved the choreography in each, but in addition, both dances brought a tone of community, playfulness and fun to an act that tends to be more reflective and earnest in quality and atmosphere. Speaking of fun, Act II’s ‘Cool Christmas’ was filled with it – musical theater style vignettes, vivacious characters, an impish Christmas tree, even surfers avoiding a shark. The packed house (on a Friday afternoon no less) was enthralled and entertained by the festive mosaic, as was I, though I was more pulled to the dancier episodes and less to the novelty ones. Another work by Haskins, J-I-N-G-L-E Bells had some impressive rhythmic depth. I can’t be sure if this particular rendition of the famed Christmas song was actually composed in different meters, though the choreography certainly reflected a change in pulse, making it both riveting and buoyant. With a winning collection of stomp time steps and cramp rolls turns, Shannon Hurlburt’s Rudolph the Red-Nosed Reindeer introduced yet another rhythmical element to the program. It’s a super tap duet (danced by Maggie Carey and Valerie Harmon), though there was a tendency to try and fit too many steps into a single phrase. But it was the sophisticated, chic, lyrical pas de deux that were the stars of the second half. 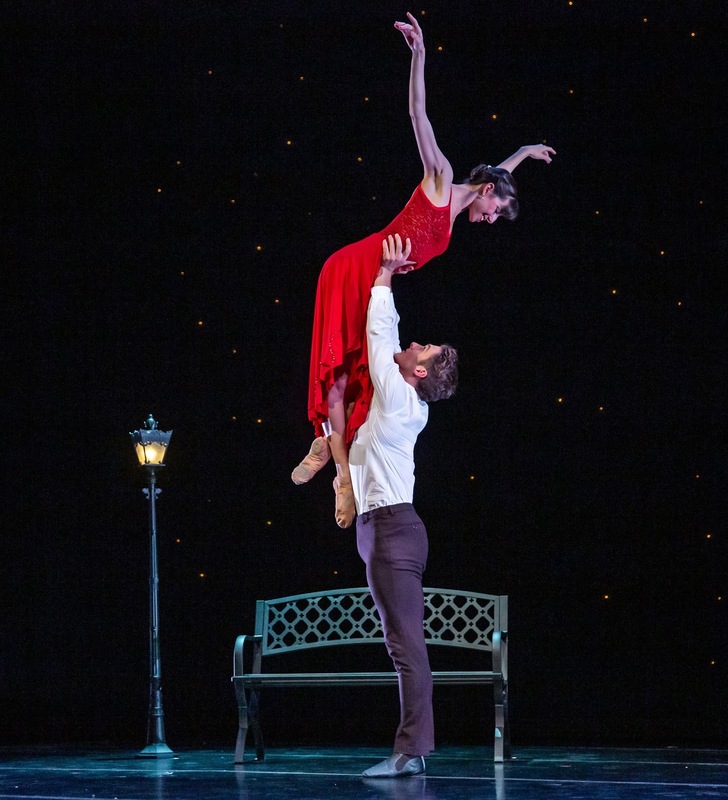 Lauren Pschirrer and Needham-Wood, in the world premiere of company dancer Erica Felsch’s Meet Me in the City on Christmas, were the tops. With starry lights and a park bench framing the glorious, grand movements, the scene could have easily been part of an old Hollywood movie musical, and Pschirrer and Needham-Wood looked absolutely stunning together. Harmon and Peter Kurta were equally sublime in Seiwert’s River. Every time I see this dance, that amazing straight-legged fifth position spinning lift takes my breath away. The San Francisco Movement Arts Festival is a mere six weeks away, arriving at Grace Cathedral with its Stations of the Movement program on Friday, January 25th. As it approaches, we are continuing our blog series highlighting just a few of the many SFMAF choreographers/companies/dance artists. This month, we caught up with Claire Calalo, Artistic Director of for change dance collective. 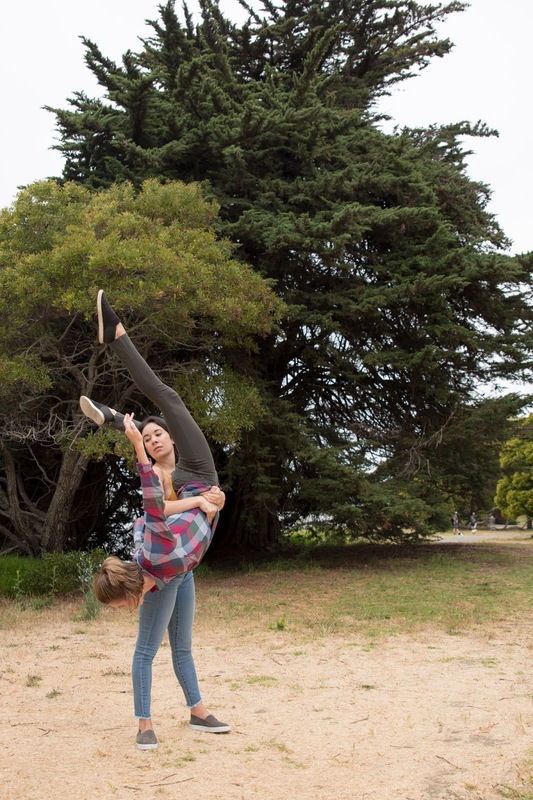 Founded by Calalo, Jessica de Leon and Lauren Baines, for change has been a part of the Bay Area dance ecology for close to a decade. Back in 2010, Calalo, de Leon and Baines found themselves craving a different kind of creative/artistic outlet. They knew that they wanted to work together to create performance with a social justice lens. But to do that, to shed light on issues like inequality and entrenched systems, the traditional dance company format felt like a mismatch. “Hierarchical, authoritarian pedagogy didn’t fit with the subject matter we wanted to explore,” Calalo explains, “we wanted a highly collaborative environment where all present have shared and equal ownership over the work, where everyone is invited to contribute choreography and movement.” To that end, they formed for change dance collective with the goal of living into this process of “democratic dancemaking.” And the pursuit has been a fruitful success; the collective has been quite busy since those early days. They have presented three home seasons over eight years, the most recent entitled At Night, We Go Inside To Sleep this past October at Dance Mission Theater. In addition to these full-length evening endeavors, for change has also dipped their toe into the thriving Bay Area dance festival circuit with several different appearances including, of course, at the San Francisco Movement Arts Festival. for change dance collective is one of SFMAF’s veteran companies having participated in all three past Stations of the Movement, and being slated for 2019’s edition as well. In the first year, they brought work that had been a part of a recent program; in 2017, an excerpt of a piece that had been created for SAFEhouse Arts’ West Wave Dance Festival; and last year, gave audiences a preview glimpse into what was percolating for the collective’s upcoming home season. Being different works, each had their own payoffs and surprises; challenges and lessons, but they did share something in common. All provided the opportunity to take a deep dive into the site-specific process. “Adapting the work to the space and responding to the environment in a site specific way, the excerpts inevitably change,” Calalo describes, “they become less like an excerpt from a larger idea and more like a dedicated, new experience.” for change has also been fortunate to be able to dig into this site-specific philosophy throughout the cathedral. Every year, they have been part of a different station – the Station Behind the Main Altar, Station in Front of the Nativity Chapel and Grace Chapel. The trend continues this year as the group will be part of yet another station, the Station by the Glass Doors, directly to the left of the cathedral’s central pulpit. Certainly a dramatic backdrop to frame for change’s dramatic 2019 offering. They will be revisiting a section from their recent home season at Dance Mission, the result of their years-long collaboration with Teatro Catalina, a non-profit organization that provides arts education in rural Nicaragua. “Our collaborative project with Teatro has been all about taking stories of survival and resilience and translating them into a theatrical container,” relays Calalo. October’s home season featured a series of multi-layered vignettes, and for SFMAF, they will be bringing one of these penetrating stories, a narrative that centers on motherhood, endurance, instinct and perseverance. Primarily a solo (though other performers will join the scene from time to time) danced by for change collective member and mother of three Ruth Perez, the choreography mines gesture and modern genre physical vocabulary, with lots of floorwork and release technique influences. And like most of for change’s work, spoken text is incorporated, which in this case, was recorded by the woman who inspired the piece, Dona Catalina. But with the Station by the Glass Doors being one of spaces without recorded sound, for change is playing around with the idea of having someone come in and speak the accompanying monologue. Be sure to come by on January 25th and check out the final iteration devised for SFMAF.